Obituary for Amelia Rose Hamm | Clawson Funeral & Cremation Center, Inc.
Amelia Rose Hamm, 7 months old, whose home was in Leechburg, died peacefully on Tuesday, December 4, 2018, at Children’s Hospital of Pittsburgh with her Mommy and Daddy by her side. Born at just 2 pounds, 9.6 ounces and 14 inches long at 28 weeks, 1 day gestation at West Penn Hospital in Pittsburgh on April 25, 2018, she was transferred to Children’s Hospital of Pittsburgh on April 28, 2018 where she remained until her passing. Amelia Rose was the daughter of Zachary and Lisa Alberts Hamm of Leechburg. Amelia Rose lived most of her life at Children’s Hospital of Pittsburgh due to the complications of both prematurity and heart defects associated with Down Syndrome. She was a brave, beautiful fighter throughout her entire life, and an inspiration to so many. She is survived by three brothers, Austin Suman, Donavin Sowers, and Isaac Hamm, all of Leechburg. Her paternal grandparents are Dennis and Amy (Rozewicz) Hamm of Natrona. Her maternal grandparents are Larry and Lisa Alberts of New Kensington. Her great-grandmothers are Leona Hamm and Clara Sosinski of Natrona and Irene Rozewicz of Natrona Heights. She is also survived by her uncle, aunt, and cousins, Paul, Casey, Emma, and Harrison Rocchini of Springdale; her aunt, uncle, and cousin Beth Alberts, Ryan Maritz, and Isabella Maritz of Vandergrift; and many great-uncles, great-aunts, family members, and friends. Amelia Rose was preceded in death by her paternal great-grandfathers, Harry E. Hamm, Jr. and Theodore Rozewicz; her maternal great-grandmothers, Berniece Alberts and Dee Cravener; and her maternal great-grandfather, Lew Cravener. In her brief life, she enjoyed listening to her family talk, sing, and read to her, especially big brother, Donavin. 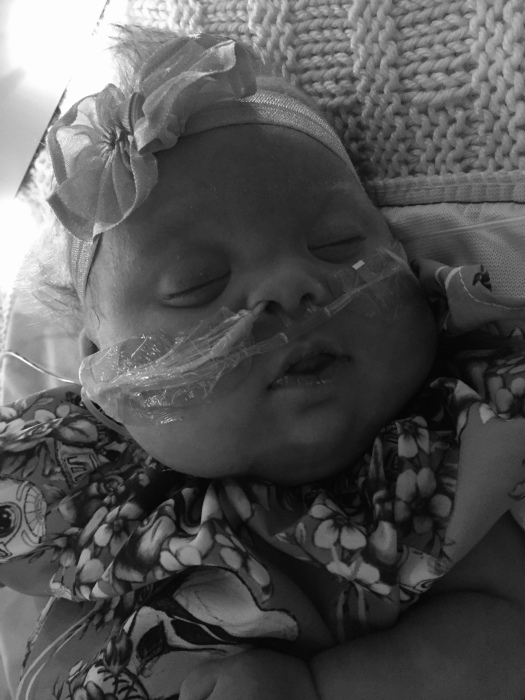 She enjoyed keeping her incredible NICU and CICU nurses, doctors, and therapists on their toes. Music therapy became a particular favorite of Amelia’s. In addition, she became a fashion icon in the NICU and CICU, where her Mommy, Daddy, and nurses enjoyed dressing her in her beautiful dresses, booties, hats, bows, and crowns. Friends will be welcomed by her family on Friday, December 7, 2018 from 3-6 PM at Clawson Funeral & Cremation Center, 170 Main Street, Leechburg (724-842-1051) where funeral ceremonies will be held at 10 AM on Saturday, Dec. 8, with the Rev. Colleen Klingensmith officiating. Interment will be private at the convenience of the family.